This conference featured keynote presentations, presentations by students from Research Experiences for Undergraduates (REU) programs in all disciplines, sessions for REU students, faculty, and administrators, and opportunities to present to representatives from the National Science Foundation (NSF). Poster sessions were displayed in the NSF atrium. Elizabeth City State University (ECSU) was represented by Maeah J. Walthall who took part in the Summer of 2015 REU at ECSU. Her research was titled "Autochamber Measurements of Net Ecosystem (CO2) Exchange at a Subarctic Mire in Northern Sweden. Her mentor, an ECSU graduate, was Mr. Ryan Lawrence, a graduate student at the University of New Hampshire. Ms. Walthall's poster can be found at: http://nia.ecsu.edu/reuomps2015/teams/arctic/Slide1.jpg. Dr. Linda Hayden, principal investigator of the Center of Excellence in Remote Sensing and Education (CERSER), also attended the symposium. 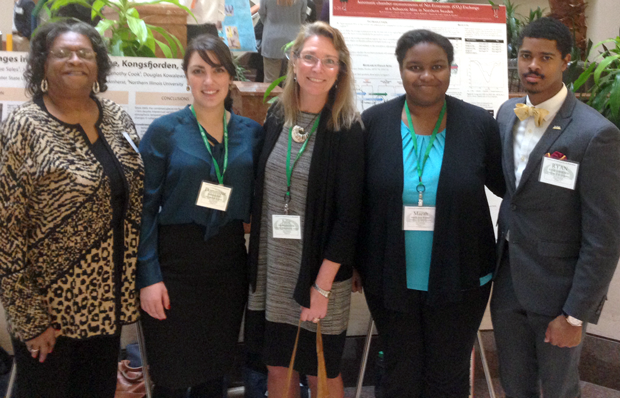 On October 25-26, 2015, over 120 undergraduate researchers from various colleges and universities in the United States, along with research faculty and staff, principal investigators, research program directors, and program officers from the National Science Foundation (NSF) gathered in Arlington, VA for the Council on Undergraduate Research (CUR) - Research Experience for Undergraduate Symposium (REUS) 2015. During the REUS, undergraduate researcher’s presented their respective REU projects in the NSF atrium, networked with conference attendees, listen to a keynote address by NSF Program Officer Dr. Nicole Bennett, and attended workshops, such as Applying for Graduate School Support from NSF and Effectively Leveraging an Undergraduate Research Experience on your Resume. Representing Elizabeth City State University (ECSU) were Dr. Linda B. Hayden, principal investigator of the Center of Excellence in Remote Sensing and Education (CERSER), Ms. Maeah Walthall, who completed her research project on the campus of ECSU, and Mr. Ryan Lawrence, an ECSU Alum and past REU program participant, REU in Ocean, Marine, and Polar Sciences (OMPS) 2015 faculty mentor, and current PhD student at the University of New Hampshire. On Sunday, October 25, 2015, Dr. Elizabeth Ambos, Executive Officer, CUR, greeted conference attendees’ and Dr. Bennett discussed interdisciplinary research and collaboration, promoted critical thinking, as well as the benefits of undergraduate research during the keynote address titled The NSF REU Program: Establishing a Lifetime of Discovery. 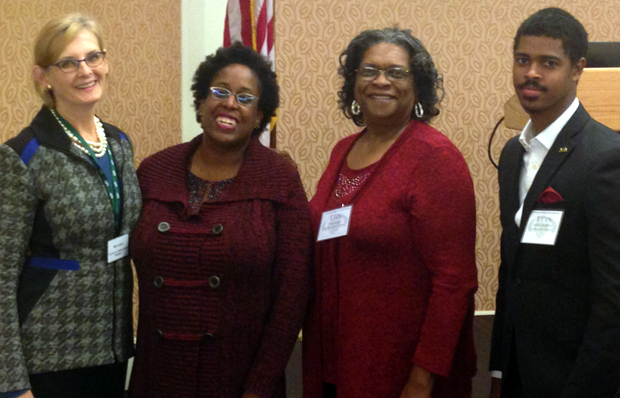 The keynote address was followed by a networking session. The next day, REU participants presented in one of four research poster presentation sessions encompassing a ranged of research fields, such as: arts and humanities, social sciences, education, health sciences, psychology, biology, chemistry, engineering, geosciences, mathematics and computer science, physics and astronomy, and polar science. 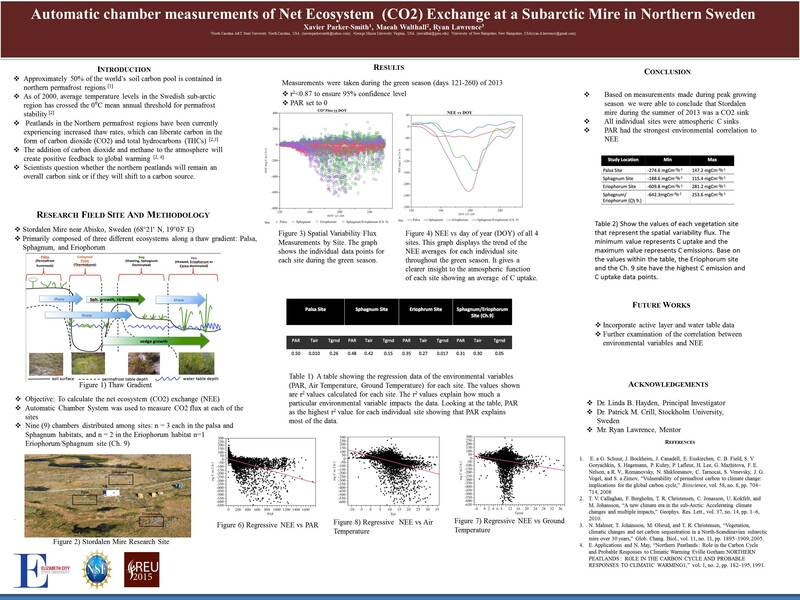 During the poster session focusing on polar and earth sciences research, Ms. Walthall presented her summer research titled Automatic Measurements of Net Ecosystem (CO2) Exchange at a Subarctic Mire in Northern Sweden. The symposium closed on Monday afternoon with reflections from the REUS attendees’ and a discussion on upcoming CUR REUS’s. Overall, the RESU was a great avenue for undergraduate researchers to share their research, network with their peers and principal investigators/ program directors of various NSF REU programs, and engaging in various professional development workshops.